I hope no one has been holding their breath waiting for me to post a blog in Hong Kong, but if you did, wow! You have held your breath for almost six months. I’m with you…I’ve been holding mine too. I just haven’t known been able to find a voice for my blog. Believe me, the irony is not lost on me that Brogden Middle School’s “Most Talkative Girl” award winner can’t find her voice. I didn't want to be that girl who moved somewhere far away that blogged about how much her upper middle-class life has changed. But, I do have things I want to say and I am required to blog contractually. I think I’ll start by trying to talk about something I really care about: WOMEN. So, why are women important to Hong Kong? What has pulled women into the work force in Hong Kong? What has pushed women out of their native countries and into Hong Kong as foreign domestic workers? In the past decade, Hong Kong’s GDP has grown by 50%, and housing prices are at an all time high. As of 2016, Hong Kong boasts the most expensive housing market in the world. However, the median household income has risen by only about 10% in recent years. Single income homes have rapidly become insufficient for families to live on. Hong Kong seems so wealthy. It seems impossible that there is poverty. However, the Gini coefficient of Hong Kong is 53%. In comparison, the Gini coefficient of the UK is 32%. To survive, therefore, all adults need to work. This has pushed more and more women out of the house and into the work force. With adults being pushed into the workforce and out of the home, what do they do? If your monthly household income is higher than USD$1,925, you hire a foreign domestic worker(FDW). 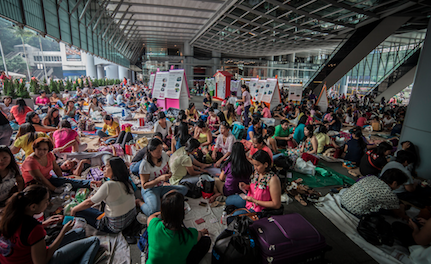 Due to high demand for help, there are 350,000 foreign domestic workers living in Hong Kong. The demographic breakdown of the nationalities of foreign domestic workers in Hong Kong looks like this: Philippines 51%, Indonesia 48%, 1% other south Asians. Why are women leaving their family and friends in the Philippines and Indonesia and coming to Hong Kong? The salary for a domestic worker in Hong Kong makes USD$540 month. To put this into perspective, compare this salary to the salary of a mid level job commonly occupied by a woman such as nurse or a teacher. In Indonesia, nurses and teachers make around USD$190 per month. In the Philippines, the salary of nurses and teachers would roughly be USD$300 per month. The reality of the situation is that these women will make much more money as a domestic maid in Hong Kong, than as a teacher or a nurse in their native country. Most FDW’s send all or most of their money home; that amount of money can change their family’s lives. 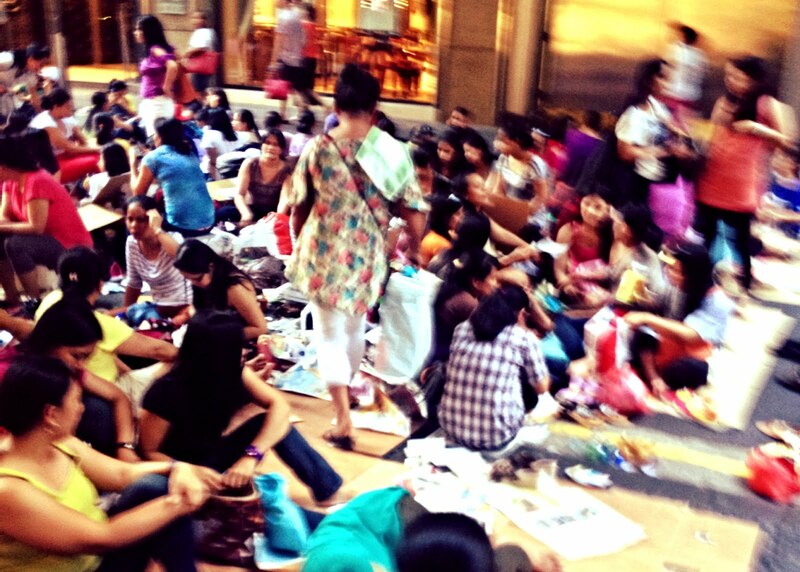 I work for a non-profit organization called Helpers for Domestic Helpers (HDH). We give free legal aid to FDWs. Here is what we typically do: interview clients, explain to them their legal rights and guide them in pursuing claims in the Labour Tribunal and other courts. We give them advice in cases where they are accused of criminal offense. We help them draft witness statements and court documents for use in court proceedings. We prepare clients for conciliation meetings and court hearings. We help write letters to employers and recruitment agencies on behalf of clients and helping to negotiate settlement agreements when possible. We help give a voice to a population that has been forced into silence. FDWs women make up 3% of the population of Hong Kong, yet they are treated as outsiders. Legal and human rights violations against FDWs include: underpayment, denial of rest days, inadequate privacy and sleeping arrangements, physical, verbal or sexual assault, extortionate placement fees, human trafficking, and exploitation. Many of the abuse related issues arise around the “live-in rule” which requires FDW’s to live with their employer. Hong Kong flats are notoriously small, leaving little to no space allocated for a FDW, forcing them to sleep on the floor, in the kitchen or in common areas. Close and constant proximity puts FDWs under constant scrutiny. Imagine living at work. The forced proximity of the live-in rule can lead to physical and psychological abuse. Treatment of domestic workers made international headlines in recent years after the case of Erwiana Sulistyaningsih, an Indonesian domestic helper who was physically abused by her employer for six months. Erwiana opened up many people's eyes to the treatment of domestic workers in Hong Kong. A less statistical but prominent motive for mistreatment of FDWs is racism and social prejudice. Agencies exploit FDWs because they are vulnerable, employers treat them as inferiors, and the government officials ignore their suffering in the court. It’s an ingrained part of the culture here. 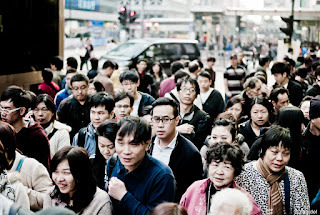 Most adult Hong Kongers were raised by FWDs and some continue the cycle of entitlement, superiority and disrespect that their parents started. Without anywhere to go on their one day off a week, domestic workers congregate anywhere they can. Thousands upon thousands of women sit on cardboard boxes under overhangs, in stairwells, and in tunnels. This is their time to talk freely, rest, and relax. These women move away from their families and friends to a country they have never been to before. Due to confidentiality, I can't tell the stories of my clients. And to tell you the truth I don't feel its my place. HDH did a video series that gives a voice, although anonymous, to some of our clients. It's been humbling to work with these women. Pushed down by society, their employers, their agency, these women continue to live, and continue to smile. All of my coworkers at HDH are women. Most are volunteers with professional backgrounds. Many retired lawyers, solicitors, and executives, some professional moms taking time off for their kids. They are smart and driven but empathetic and compassionate. They treat our clients with care and respect. I am by far the youngest employee at HDH. I think most of them would contend the “by far” part of that statement, but I like it this way. I like it because I am constantly learning from them. Learning how to be a woman, how to be a professional, how to be a person with integrity. I make notes in my head of advice they give and things they say. They speak from their experiences, about their lives, things they’ve seen. They laugh with (at) me, they support me and they encourage me. My days at HDH never look the same. This week, for example, I worked in the office, interviewing clients and writing letters. I also accompanied a client to give a statement to the police and accompanied a different client to her court hiring. Sometimes I laugh with my coworkers and clients. Sometimes I feel victorious when justice is served in court. Sometimes I go home with a sick feeling in my stomach. Sometimes I have to ask women twice my age when the last time they had a meal was. Sometimes I get frustrated and want to scream. Sometimes I feel helpful. Sometimes I feel like I’m not. I’m still learning. I’m 23, I live in Hong Kong and I don’t know anything. I thought I knew some stuff before I came here but as it turns out, I know very little. Of life, hardship or suffering, I have limited experience. The one thing I do know is that my voice is not the most important. I’ve always thought I contribute best though leadership and being outspoken. Its not easy, I’ve been trying to bite my tongue. When I take the time to listen instead of just biding my time before I can speak again, I gain more understanding. Listening can be more important than speaking. All I know is that I need to keep listening. Hong Kong Justice Centre's Report "Coming Clean"
Dear MaryGrace, we just spent the holiday weekend together as the Lemler family at the lake cottage and all of us send our love to you including Katie's new baby boy Thomas! We can't wait to see you at jakes wedding! Much love to you and to the hearts of the women you are helping!